The Junior League of Kansas City, Missouri, partners with area organizations who share a goal of improving Kansas City. 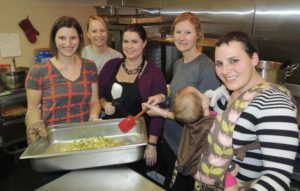 The JLKCMO provides volunteers and funds to nonprofit agencies in the metropolitan area. The application process is closed for projects in the 2019-2020 League year (June 2019 – May 2020). The application for partnerships in the 2020-2021 year will open in summer, 2019. If you have questions, please contact the CV&G committee. Amethyst Place, a recovery house for women and their children. Girl Scouts, working to help Scouts achieve their silver award. Lazarus Ministries, which provides compassion and care for unmet needs for those in the urban core. Solace House, where children who have lost loved ones receive grief support. Wayside Waifs, a no-kill shelter for animals. The JLKCMO has partnered with more than 350 agencies and helped found The Children’s Place, Children’s Center for the Visually Impaired, Children’s TLC, Jazzoo at the Kansas City Zoo, Loose Park’s Japanese Garden and many more. Learn more about our history of service in Kansas City.